Below are the official WWE 60 seconds in Hell video to hype you up for Hell in a Cell! WWE Description: Kurt Angle defends the WWE Championship against The Undertaker, Triple H, The Rock, Rikishi and “Stone Cold” Steve Austin. With six men inside on cell, it’s guaranteed to be hell! Greatest Hell in a Cell Matches Box Set on Sale! 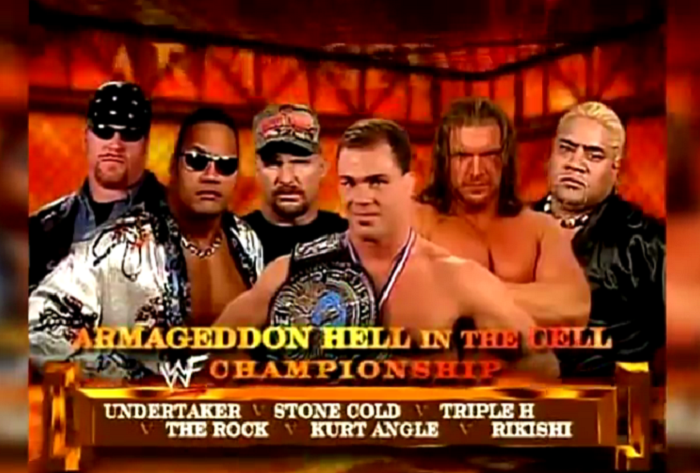 WWE Description: Relive the first ever Hell in a Cell Match in 60 seconds! Nobody knew what to expect inside the cell but Shawn Michaels and The Undertaker showed everyone how destructive the Hell in a Cell can be. WWE Description: Bitter rivals Shawn Michaels and Triple H battle one last time inside Hell in a Cell. Which former best friend will walk out of the cell as the winner? WWE Description: Mick Foley puts his career on the line when he challenges Triple H for the WWE Championship. Who will survive Hell in a Cell? WWE Description: The Undertaker’s WrestleMania streak is on the line when he faces Triple H inside Hell in a Cell. WIth Shawn Michaels as guest referee, will The Undertaker walk out of WrestleMania 20-0?